WASHINGTON, D.C. -- Americans are divided on which part of their divided government should have more influence over the direction the nation takes -- Democratic President Barack Obama (40%) or the Republicans in Congress (43%). These results come from Gallup's annual Mood of the Nation poll, conducted Jan. 5-8. Republicans have, after their electoral victory last November, assumed control of both chambers of Congress, but appear to have lost their immediate post-election glow. 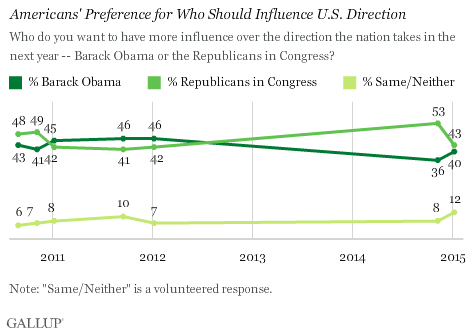 Just after the midterm elections that so decisively favored Republicans, 53% of Americans said they would prefer that Republicans in Congress have more influence over the nation's direction, whereas 36% opted for Obama, for a GOP-tilted spread of 17 percentage points. The spread is now within the margin of error, though mostly as a result of Republicans losing support -- 10 points -- rather than Obama gaining it. The 40% of Americans now preferring that Obama have the greater influence is only modestly higher than his record low of 36% set in November. Twelve percent of Americans, up from 8% in the last reading, do not choose a side, saying "both" or "neither" should have the greater influence. 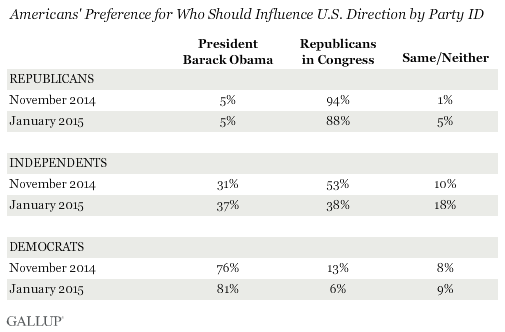 Arguably, from the midterm elections until Republicans officially took control of both houses of Congress on Jan. 6, Obama has had greater influence in shaping events. After the midterm elections that delivered a stinging rebuke to Obama and that threaten to make his last two years in office more difficult, the president has unveiled a number of major policy shifts, including a diplomatic outreach to Cuba, an executive action to protect a number of residents living in the U.S. illegally from deportation and concluding a bilateral deal with China on carbon emissions. But while Obama may have seized the agenda at least temporarily, this new gumption has not translated into a noticeably larger amount of Americans preferring Obama on this question. Still, Obama's standing in the seventh year of his presidency is at least stronger than that of his predecessor, George W. Bush, in 2007. Bush famously called himself the "decider," but by his seventh year in office, few Americans (32%) wanted Bush to decide. More than six in 10 (63%) wanted the Democrats in Congress, and their newly won majorities in both houses, to have greater say over the nation's affairs. At the time, Bush was dogged by a low approval rating (37%). Obama's approval rating, though not spectacular, is better than Bush's was at a similar time in his presidency. President Bill Clinton, in contrast to his two successors, can claim that he was the more preferred political actor in the seventh year of his presidency, though he seemed to lose significant support over the course of the year. In January 1999 -- shortly after the House of Representatives voted to impeach the president -- 55% chose Clinton over congressional Republicans to lead the nation, perhaps as a show of support for a popular president against a hostile Congress. By April, though, the figure had fallen to 44%. Fewer than four in 10 self-identified independents today say they would prefer that congressional Republicans have the edge in setting the nation's direction, down from a majority (53%) in November. Indeed, about as many independents now say they would like Obama to lead (37%) as say this about the GOP (38%) -- a stark turnaround from November, when independents tilted heavily to the GOP. Those affiliated with both major parties, meanwhile, strongly prefer that the leader(s) of their respective parties have the greater influence over the nation. Second-term presidents serving their final two years can often seem like reduced figures in the political landscape, as their ability to shape public policy is perceived to diminish. Many factors contribute to this perception. For instance, in the modern era, nearly all second-term presidents have had a Congress controlled by the opposition party in their final two years (only Lyndon Johnson had an allied Congress) -- but a main factor is that second-term U.S. presidents are typically less popular than they were in their first terms. 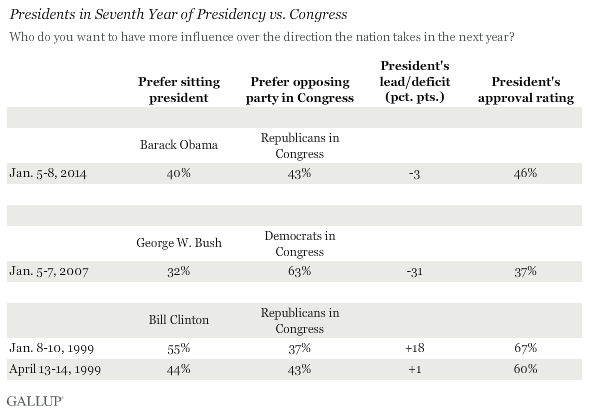 And this erosion in public support in turn reduces the president's ability to influence Congress. Obama has tried to stay ahead of these historical forces by launching a flurry of policy moves, but the proportion of Americans preferring his guidance on the nation's direction has increased only marginally. Republicans in Congress, for their part, have seen a substantial drop in support from November, just as they begin to try their hand at governing. Ratings of the economy have greatly improved since the November elections, which could be one reason fewer Americans support the GOP. Indeed, the improving economy could eventually give Obama the edge on this measure, perhaps giving him the political momentum. But at the moment, judging by public opinion, it appears the last two years may not be better or worse for Obama, but rather more of the same: a nation divided, with both sides fiercely contesting that they have the mandate to lead it. Results for this Gallup poll are based on telephone interviews conducted Jan. 5-8, 2015, on the Gallup U.S. Daily survey, with a random sample of 804 adults, aged 18 and older, living in all 50 U.S. states and the District of Columbia. For results based on the total sample of national adults, the margin of sampling error is ±4 percentage points at the 95% confidence level. All reported margins of sampling error include computed design effects for weighting. The new, Republican-led Congress begins with a 16% approval rating, identical to the last rating of the preceding Congress. But GOP lawmakers can probably expect more support, at least from Republicans, as they pursue their agenda. Congress' job approval rating averaged 15% in 2014, just one percentage point higher than last year's historic low. Republicans and Democrats gave equally low ratings of Congress, at 15%, and independents remained similarly negative at 14%. Americans' frustration with Congress may bring more voters to the polls on Election Day, as it has in recent midterm elections according to an analysis of historical Gallup data, but divided control of Congress may work against that.